Whether he was intended to be or not, Brazilian midfielder Fred was the marquee signing of the summer for Manchester United, arriving from Shakhtar Donetsk in a £52million deal. Manager Jose Mourinho eyed further major reinforcements but the transfer deadline passed with the 25-year-old midfielder the standout Old Trafford acquisition. So, when the Premier League resumed for it’s 27th season on Friday night, all eyes were on Fred as he made him United debut against Leicester City at Old Trafford. And the Brazil international impressed, lining up in midfield alongside Paul Pogba and Andreas Pereira. Our friends at Football Whispers have run the rule over Fred’s Red Devils bow in order to understand what exactly he adds to Mourinho’s side. Fred’s involvement with Brazil at this summer’s World Cup in Russia, where he remained an unused substitute amid whispers of a niggling injury, has meant he has not been afforded a full pre-season with his new club. Therefore it may be a few weeks, months even, before the midfielder is fully up to speed and assimilated with his new team-mates, accustomed to the manager’s instructions and comfortable under the bright lights of Old Trafford. None of this deterred Mourinho from throwing Fred straight into the thick of the action on the Premier League’s opening weekend, however. And Fred quickly set about allaying any fears of his readiness for top-flight, competitive football. Stationed on the right side of United’s midfield three in a 4-3-3 formation, he looked at home in the Red Devils’ middle third. Above all, what Fred added was balance. Throughout Mourinho’s time in charge at Old Trafford, the Portuguese coach has struggled to find the right combination in midfield, flitting between two and three-man set-ups, rotating through the likes of Ander Herrera, Scott McTominay and Marouane Fellaini. 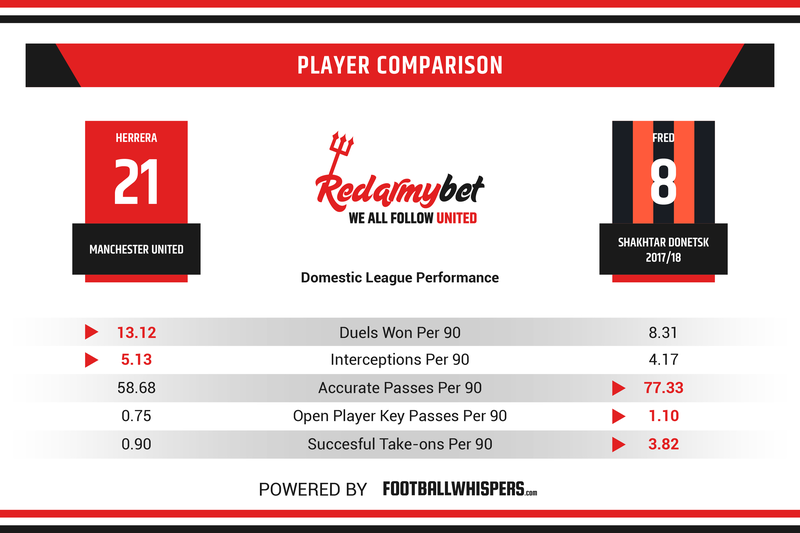 While the injured Nemanja Matic will almost certainly reclaim his position at the base of midfield, Fred instantly looks a shoo-in to play opposite Pogba in the other more advanced role. With plenty of energy, Fred hustled and harried the Foxes on Friday night, making three interceptions and one tackle as he assisted Pereira in screening the back four. He was also confident on the ball. Some have pointed to a couple of errant passes as evidence of his continuing adaptation to his new surroundings, but Fred completed a staggering 92.5 per cent of his 53 attempted passes, including finding a red shirt with all seven of his attempted long balls – only centre-back Eric Bailly, who saw around half as much of the ball as Fred, completed a higher overall percentage of passes (95.8 per cent). 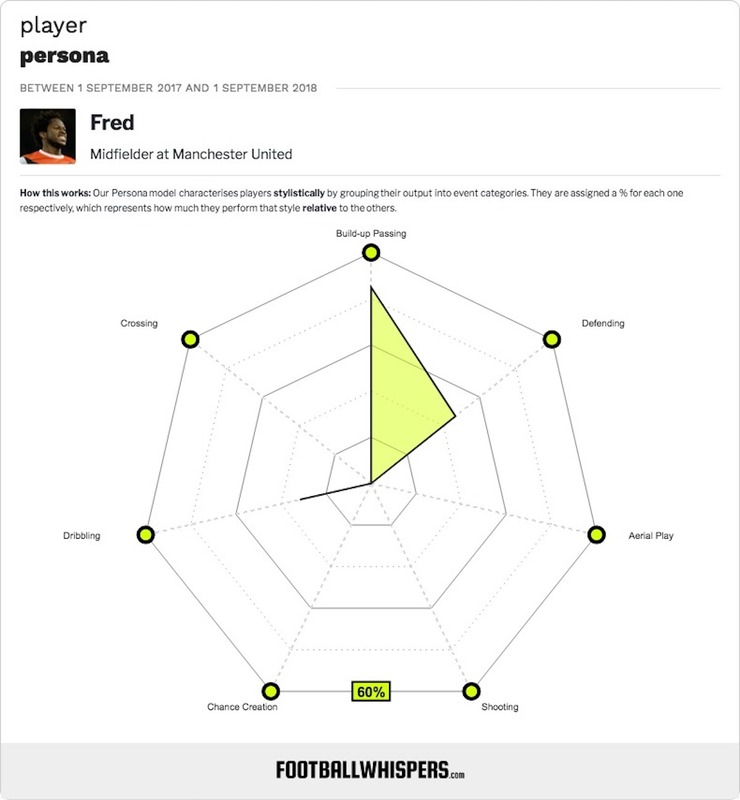 Mobility is the key to Fred’s ability to bring much-needed balance to the United midfield, especially when Matic returns, as the Serbian cannot count athleticism among his many gifts. Fred covers ground tremendously well from his box-to-box role, able to spring forward to launch or join attacks, as well as being willing to track back and carry his share of the defensive workload. A fine dribbler and a capable creator when given the chance, Fred produced a more reserved display against Leicester, allowing Pogba the freedom to roam and influence proceedings in the attacking third, with the Frenchman completing six take-ons and showcasing his wonderful range of passing throughout. But the fact Fred has such creative skills in his locker will ease the burden upon Pogba’s shoulders, offering help when confronted with a stubborn defence that needs to be unlocked. The 2-1 victory over Leicester was a modest beginning to Fred’s United career, substituted after a fine, 74-minute shift, and there is undoubtedly more to come from the Brazilian. But promising signs of the way he will improve United’s midfield were in full view.